A recent report of a recluse published on a Chinese blog shows how badly political violence can disturb the mind. After the Tiananmen Square Massacre in 1989 ,Wang Qingsong, a PhD student at Peking University, along with his wife, who used to teach English at Peking University, fled to remote mountains in northern China. The couple have been leading a life of seclusion, in primitive conditions, for the past 22 years. Wang’s life was brought to light recently through a blog posted by his former classmate Tang Shizeng, a photographer for Xinhua News Agency, and reported by Apple Daily on March 29. Wang Qingsong was born in Xinyang, Henan Province. He learnt martial arts at Shaolin Temple when he was young, and was later admitted to the Department of International Politics in Peking University in 1979; in 1989 he joined the PhD program. He once served as the secretary of the Communist Youth League in his class. After the 1989 Tiananmen incident Wang and his wife both resigned from Peking University and left for a remote mountain area in Hebei Province. Tang records Wang’s life complete with photos in his blog. Wang and his wife live in the wilderness, in a house built with mud. They farm, cultivate wasteland, and raise animals for a living. There is no electricity, no television, no telephone, no Internet. The only thing they bring in from the outside world is salt. 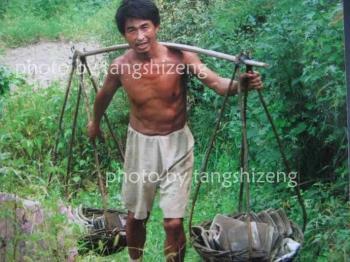 The living conditions are so primitive that Wang himself had to assist his wife during childbirth. Wang’s wife has gone from being a teacher in the English Department of China’s most prestigious university, to a peasant woman. She has been out of the mountains on only two occasions in the past two decades: to change her ID card, and to report the loss of her bankbook. In the mountains, they do not use pesticides or chemical fertilizers. Soap, shampoo, washing powder, and such are strictly prohibited, so they clean with charcoal instead. Cars are also forbidden, meaning that all the provisions are carried by Wang, who balances them on a pole on his shoulder. The couple own hundreds of black goats, three pigs, dozens of cattle, and some horses, mules, and donkeys. Their 8-year-old son takes charge of the herd. “Actually, anyone can live in such an environment. It depends only on one’s state of mind,” said Wang’s wife. Tang, the photographer, says that the Wang family doesn’t want to leave the mountains and doesn’t want visitors. Tang and other commentators noted that the massacre of 1989 obviously had a big impact on the Wangs. New statistics from the United Nations Children's Fund show that one in four Congolese children never make it past five years old, because of malnutrition.